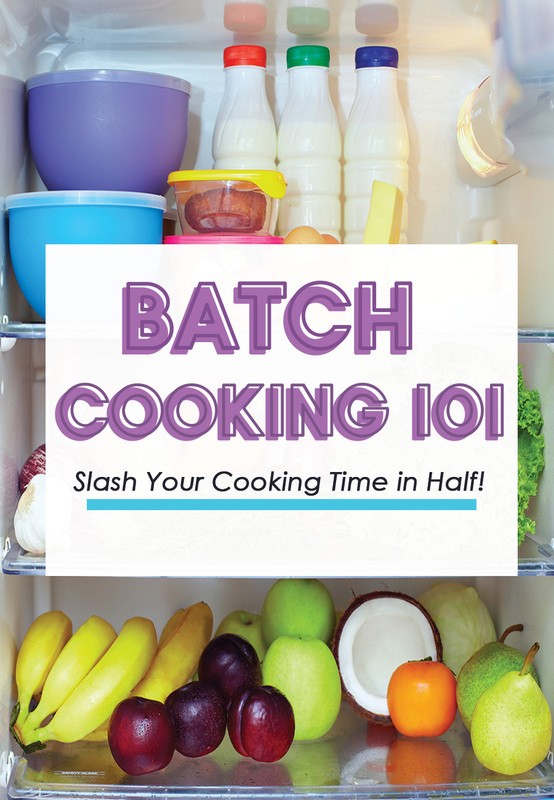 Batch Cooking 101: Slash Your Cooking Time in Half! Are you ready to save time and money? Ready to be less stressed and spend more time with your family than in the kitchen? importantly, you’ll save time in trips to the store, daily cooking and prepping, and cleaning up! Most people who use this method actually make only the main meal’s main course, although side dishes and breakfast items also fit well into this method. Once a month cooking is NOT for everyone, but it IS for busy people who choose to plan ahead. Remember, a fail to plan is a plan to fail. If you’re new to batch cooking, then may we suggest partnering up? You may find that it’s more fun and more effective to cook with a friend or relative. Not only does this give you quality time with a loved one, it gives you double the hands to help in the kitchen! Another tip for those just starting out is to start small. Try cooking for one week or two weeks at a time, as opposed to cooking for a month. Another idea is to double your dinners and freeze half for another night. This will give you a chance to see what works for you and what doesn’t so that you can make adjustments before going for the gusto. After a few small sessions, you’ll have the confidence to start prepping for longer periods of time. Imagine getting a month or more of meals done and in the freezer? What a relief that would be! Lastly, don’t get overwhelmed! 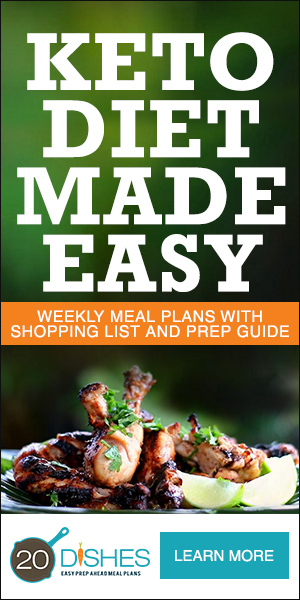 Even if you only get 7 or 14 meals out of your batch cooking prep day, that’s one to two weeks with no cooking at all. Just remember how good it will feel to come home after a busy day and know that dinner is only a few minutes away. Step 1: Plan your meals. keep your costs down and keep you organized. example, if top sirloin is on sale, you could have fajitas, marinated flank steak, peppered beef, beef and broccoli, and beef stew (just to name a few!). Pick out the meals your want, locate your recipes (see the resources section for trusted recipe resources), then build your master grocery list. Step 2: Use The Grocery Builder. Use the Grocery Builder (see example below) to create your shopping list. 1. Trying a new recipe? Although you may think the recipe is great, your family may not, so be sure to only try ONE serving of each recipe. It would be really horrible if you had a freezer full of food that your family hates. 2. The more recipes you plan on preparing, the longer it will take to prepare. Variety is the key to life, but it will be easier and much faster if you select a core set of recipes to rotate through, rather than thinking you must eat a brand new recipe every day. the end of this book for tips. 4. You don’t have to actually calendar these meals (unless you want to) but keep in mind that there will be nights that you may not be home or will be short on time, so plan accordingly. 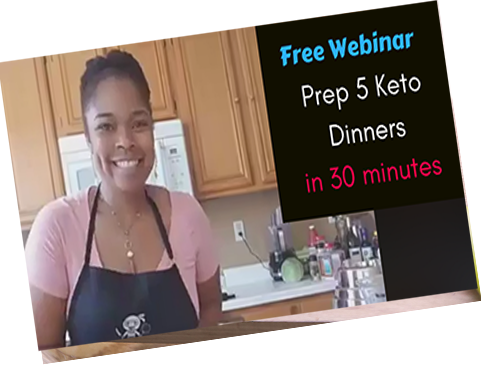 You might want to plan four taco nights a month because you know that you have a PTA meeting every Tuesday and will not want to make a complicated meal that day. 5. Label your storage containers. Masking tape works well if you don’t want to pull out 30 bags and label them. This also works well for mason jars and things that will be wrapped in foil like meatloaf. 6. 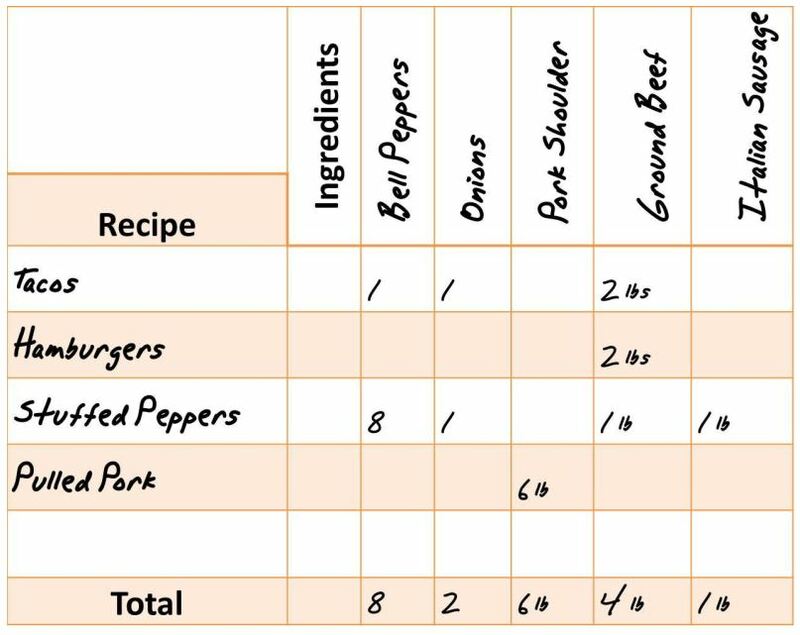 Process any straight-to-freezer items like hamburger patties the same day you shop to free up refrigerator space. OK! Now that you have planned your meals and done your shopping, you’re ready to get cooking! outlines everything you need to do when you step foot into your kitchen. Next, make sure you review your recipes and make a list of things that need to get done for each recipe (i.e. chop onions, make sauce, etc.). 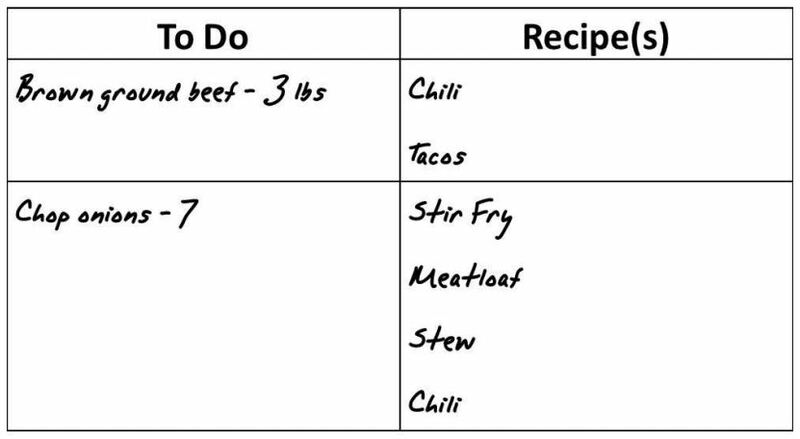 It is helpful to identify the order that they need to be completed so that you don’t waste time referring back to the recipe every few minutes. TIP: Use a Game Planner worksheet . Here is an example. you longer initially. But, don’t fret if it takes you longer than expected. Once you get the system down, you will be able to dramatically shave off some of that time the more you do it. 1. If you are cooking for one to two weeks, you will need 4 hours to cook. If you are cooking for a full month, you may need upwards of 8 hours. While this seems like a lot of time at first, just remember how much time you will be saving on those busy weeknights! 2. Have a meal in the slow-cooker for cooking day as you probably will not want to cook a meal after having cooked all day. 3. If you are planning on including baked goods, you may need to plan another day in as well because baked goods use a whole other set of ingredients and make a completely different mess. The nice thing is that most baked goods freeze nicely, so you may only need to do baking days once every two months or so. 4. Remember to label everything with a permanent marker – pen doesn’t show up well and dry-erase marker, well, erases. Masking tape works well for jars and containers. 1. Clean out the freezer and fridge before shopping. 2. Never re-freeze raw meat. Be sure to ask the butcher if you’re unsure. 3. Always cool food as quickly as possible before freezing (ice bath or in the refrigerator). 4. Use double bags for things with liquid and foil for things like meatloaf and casseroles. You can also use mason jars for soups and sauces as they also stack well with no waste! If you use the jars, remember to leave a little room in the top for expansion. 5. Flash freeze things that can stick together like meatballs and waffles by placing them in a single layer on a cookie sheet until solid. Then transfer them to a labeled freezer bag and store in the freezer. 6. Always label your meals with contents AND the date. 7. Freeze things as quickly and as flat as possible and squeeze out as much air as possible (air = freezer burn) to make stacking in the freezer super easy (and less like a bad game of Tetris). Ideally, a food 2-inches thick should freeze completely in about 2 hours. If your home freezer has a “quick-freeze” shelf, use it. 8. Once food is thawed in the refrigerator, it is safe to refreeze it without cooking, although there may be a loss of quality due to the moisture lost through thawing.